When I arrive at Where the Monkey Sleeps in Finnieston to interview the comedian Josie Long, I’m having a bit of a wardrobe malfunction. I’ve realised that there’s a theme emerging whereby every time I turn up for an interview, I always look slightly mental. This time round, I’m quite literally unravelling; my flatmate lent me one of those wrap tops, which all sensible people know are designed to unwrap at the most inconvenient of times. Luckily, Josie’s still getting ready when I arrive, so I’ve got time to go and sort myself out. Just as I’m about to leave, the person in the next cubicle emerges: ‘Be honest with me: does this look okay? I feel like this looks completely ridiculous!’ This is how Josie Long and I meet. From questionable beginnings, she gradually began gigging here and there between doing her GSCEs and A-Levels, and then went on to win the BBC New Comedy Award at the age of 17. She took a break from stand up whilst studying for an English degree at Oxford (“but I got in cos I was clever, not cos I was posh!”), and since then has performed six critically acclaimed shows at the Edinburgh Fringe, two of which were nominated for the Edinburgh Comedy Award. In between, she’s appeared regularly on panel shows‘Never Mind the Buzzcocks’ and ‘8 Out of 10 Cats’ and brushed up her acting skills with roles in programmes such E4’s ‘Skins’. That’s quite a list of achievements for someone who’s just turned 30, and now I’m here for a screening of Josie’s first short film, which she directed, produced, wrote, starred in, and funded, Let’s Go Swimming. tries to figure out what she’s doing with her life. 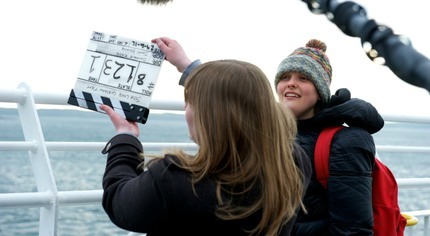 Josie is the first to admit that her character in the film is ‘a bit of a knob.’ She describes her as being a bit immature and unable to cope with being grown up, something one imagines Josie is also trying to come to terms with. “I honestly don’t think they can say that now. Actually, people who are around 20 are really impassioned and switched on and earnest in a way that I wasn’t 5 years ago, because I was very complacent thinking that the Labour government were on my team. As much as I didn’t think they were, you could con yourself, whereas with these guys, you really can’t.